With every album, the Marcus brother’s manage to continue to bring simcha to the masses and this album does not disappoint. 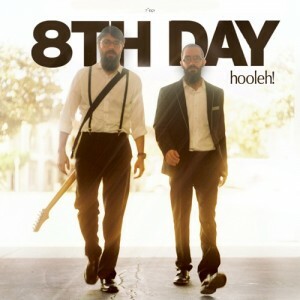 Hooleh: The theme of this song is Mitzvah Lihyot B’Simcha. This song falls into a category I have reserved for 8th day tunes like Yalili; namely Fun. The theme of simcha combined with the upbeat and fun hora beat makes this song a great song. There is no doubt in my mind that this will be another hit! Perhaps, it is just a matter of time it is tied to a music video? Wait For You: This song is rock ballad that begins with a organ keyboard sound. This song highlights the reality that although we have suffered painful moments over history, both personally and nationally, we know that with nissim, Hashem is waiting for us on the other end. The high energy arrangements highlights the fact that we are waiting in Mashiach and that he is going to come soon! Sing Along Song: This song has a reggae rhythm. The ways the lyrics are sung make this song an exciting song to sing along too. The instrumentation of this song uses a ukulele which is not something often used for a Jewish production. It is great to hear a fresh sound in this track. Thank You: The theme of this song is to appreciate everything Hashem has given us, and to appreciate all the things that are Shehecheyanu worthy. The beginning of this song uses some funky digitized sounds which give it a fast pace feel. Then the song moves to an ‘80’s feel rock ballad. The arrangements of this song would be enjoyable for someone who has an appreciation for music from 30 years ago. There is a great guitar solo in this one that adds a lot of flair to the song which is followed by a chazzanish style singing of the Shehecheyanu bracha. This song simply wishes that brachos continue to overflow! Ker A Velt: This is another Rock Ballad. The emphasis of this song is that we emerge from this galus into a full redemption turning the darkest of days and turning them into light. The instrumentation of this song brings out the emotion of this song. Are we crazy for the geulah? Fighter: Nai Nai’s and percussions are used to start this song. The rhythm is a sefardi style with a bit of swag. The song seemingly is talking about how people are not perfect and we often have inner struggles. We have try hard but we are not always perfect. Stay: I know how I feel when I listen to this song. It gives me the feeling that the song is subject to interpretation simply depending on where you are holding in your life. I think this song references the fact that this world constantly depends on Hashem’s involvement. Another rock ballad. Freedom: This rock song starts with vocal effects and emphasis on the bass drum. When the second verse begins the there is a powerful rock feel. Imagine the Jews standing at the edge of the midbar staring over Eretz Yisroel about to enter. This song has that “we have survived and are moving on” kind of warm feeling. This song of freedom is a favorite of mine. Royalty of Rhythm: This is a beautiful song about Shabbos. This one has a reggae rhythm that illustrates Shabbos in a musical and colorful tone. This song adds a sprinkle of slightly larger choir sounds to give it that “Shabbos, sing around the table kind of feeling”. This song is all English with the exception of Yom Zeh Mechubad Mikol Yomim. The song goes out with a marching beat. Never Afraid: This song starts as a rock ballad, but then jumps into a fun hora style rhythm. The theme of this song is that we stay strong regardless of the challenges. A nice guitar solo in this one to give the song some flavor. One of the words of this song that makes this a song to listen to over and is the word “Nyeh”. Try it, I think you will like it! Your Name: This song is a ballad that starts out sounding like Od Yeshvu. This is a love song. Yes, that is what I said. Your name is love. The melody of this song is simple and sweet with intracacies in the background arrangements. Simply beautiful. Enjoy another great 8th day production!